CAMBRIDGE — Colin Currie’s knack for storytelling was evident even before he stepped onstage Wednesday night. 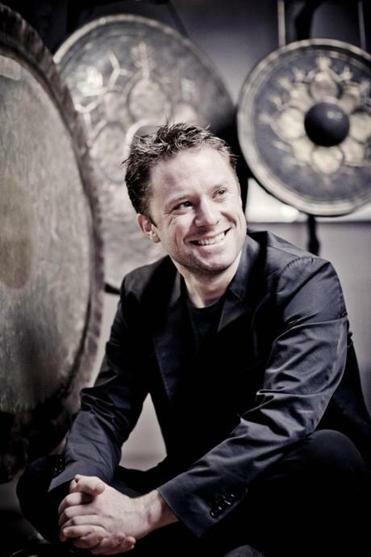 The Scottish percussionist included his own engaging, poetic notes in the program for his solo recital at Longy School of Music’s Edward J. Pickman Hall, presented as part of of Celebrity Series of Boston’s 2016 Debut Series. Many program notes are either laundry lists of facts or needlessly flowery, but Currie’s writing struck a satisfying balance of informative, colorful, and personal, with numerous striking turns of phrase (“magnificently murky marimba bath”). His words set expectations high, and his performance exceeded them. Though percussion may be the world’s oldest instrument, solo percussion repertoire is almost always recent; the earthy, rich marimba did not appear as a solo instrument on the concert stage until the mid-20th century. Currie’s choices were all published within the last 30 years, and he performed the first half of the evening, a suite of wickedly tricky pieces by four composers, entirely from memory. An airy, bright rendition of Elliott Carter’s “Figment V” for solo marimba crashed into Per Norgård’s thunderous “Fire Over Water,” the final movement from the larger work “I Ching.” A full arsenal of instruments came to play. Currie’s white mallets blurred as they raced over bongos and tom-toms, both arms and one foot maintaining distinct rhythms. He moved with taut physicality and fierce focus, tweaking each limb’s pattern and prominence, phasing them in and out. A gently flowing interlude on the vibraphone provided an oasis before the drums returned, spurring the piece to a raucous gallop, finishing with muted taps on a large gong. The final vibrations still disturbed the air as Currie played the first swells of Toshio Hosokawa’s “Reminiscence,” which explored the marimba’s rumbling, dark lower register in rolling four-mallet chords that morphed one note at a time. Bruno Mantovani’s mercurial “Moi, jeu. . .” scurried up and down the marimba’s keys, often hanging out on a single sustained note but always on the edge of upheaval. Chords splayed outward, fast and furious. The transition back into the second and final “Figment V” was seamless, the quick piece retaining the brash tone of Mantovani’s barbed melodies to tie off the suite with a drastically different disposition than it had when it started. Iannis Xenakis’s “Rebonds B” kicked off the second half with an enticingly groovy, rollicking face-off between polyrhythmic drums and clattering wood blocks. Karlheinz Stockhausen’s “Vibra-Elufa” traversed a garden of succulent vibraphone sonorities, from the gossamer of the high range to cold fire in the lows. With liberal use of the sustain pedal, each note trailed color long after the mallet had left it. During Rolf Wallin’s “Realismos Magicos,” Currie inhabited different characters with each brief movement, the solo marimba singing in diverse dialects that changed with the mallets. Eerie militaristic octaves in one scene turned into fluid major seconds in the next, and the furtive speechlike rhythms and cadences in the seconds-long movement “Dialogue With the mirror” evoked emotion too complex for words. For an encore, he carried out a single snare drum to play fellow Scot Alan Emslie’s “Hugh’s Chilled Red,” his sticks clicking and overlapping in a bracing crescendo. He bowed with a smile, having rocked the house and raised the roof. Presented by Celebrity Series of Boston. At Longy School of Music, Cambridge, Wednesday night.